The role of angiotensin converting enzyme inhibitors on the inflammation process has been demonstrated previously. In the present study, the effects of captopril on lung injury induced by lipopolysaccharide (LPS) were investigated. Control, LPS, 12.5, 25 and 50 mg/kg captopril-treated before LPS administration and captopril 50 mg/kg before saline administration groups of rats were studied. Total and percentage of differential WBC, the levels of MDA, total thiol groups, the activities of SOD and CAT, the levels of IFN-γ, PGE2, TGF-β1 and IL-4 in the BALF were evaluated. MDA concentration in LPS groups treated with all captopril concentrations, total WBC in LPS + Cap50, percent of neutrophils in LPS + Cap25 and LPS + Cap50, levels of IFN-γ, PGE2, TGF-β1 in LPS + Cap50 and IFN-γ/IL-4 ratio in LPS + Cap25 and LPS + Cap50 were significantly decreased but total thiol groups and activity of SOD in LPS + Cap25 and LPS + Cap50, percent of lymphocyte, CAT activity and concentration of IL-4 only in LPS + Cap50 group were increased in comparison to the LPS group (p < 0.05 to p < 0.001). 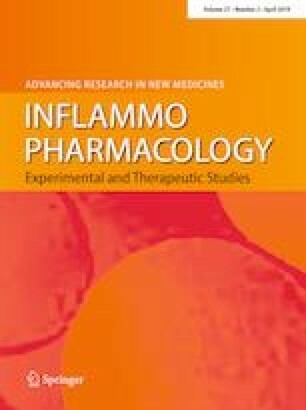 Captopril dose dependently improved oxidant–antioxidant biomarkers, the imbalance between pro-inflammatory and anti-inflammatory cytokines and showed specific immunomodulatory effect on Th1/Th2 balance in the BALF of lung injury induced by LPS. This study was financially supported by a grant from Research Council of Mashhad University of Medical Sciences. This manuscript is the results of Parma. D. Thesis of Javad Boskabadi.